One of the biggest favors one could ever do for a youth player in baseball hitting instruction is to start them batting left -handed from day one. The minute the youth player toddler puts a bat in their hands put them into the left-handed batters box. 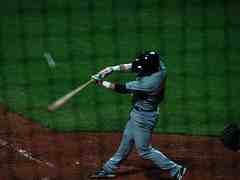 From t-ball on, put them baseball hitting on the left side of the plate. Make this the norm. Switch the hands on the bat accordingly and keep them there. Before you know it that will be normal for the kids. I remember how frustrated I was years ago when my youngest son was a tee-ball player. He would go up to the plate for his turn at baseball hitting and set up in the lefty batters box. But most youth league coaches only know that normal to them is where 90% of the people bat ---from the right side. The typical youth baseball dad coaches think unless you bat righty there must be something wrong with you. It is estimated that roughly about 10% of the world population is left-handed. It is reportedly estimated that major league baseball has about 25% of the players that are left-handed. 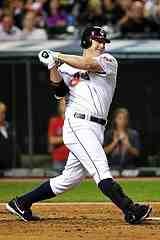 In a recent major league baseball All-Star Game 18 of the 40 players were left-handed or switch-hitters. The fruits of harvest and rewards coaching baseball hitters will not surface until the teenage years. That is when curve balls and breaking pitches start to become more commonly thrown by pitchers. As baseball instructors we know that at least 75% of the pitchers are righties. That simply means a large majority of youth league pitchers curveball will be breaking into the lefty hitter. The righty pitcher on the pitching mound loses much of their deceptive pitching advantage when the breaking ball is coming toward you rather than away from the batter. The advantage in baseball hitting is on your side. 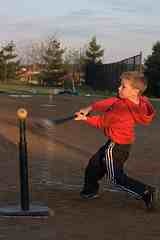 From t-ball to age 12 it will not make much difference whether a player bats right or left. There will not be as much advantage either way in the little leagues and youth leagues from age 12 and under. If your players are able to reach the high school levels and beyond look out. It comes down to supply and demand. In higher baseball coaches and managers have to have good lefty hitters to counter good right-handed pitchers on the pitching mound. I managed in AA one year in the Eastern League with only a slap hitting switch hitter as my only lefty hitter. We struggled all year and finished in the cellar. It is because we were too right-handed. We had no answer, no strategy and no counter punch to put many rallies together to score runs. Then we would see the Albany Yankees, the AA affiliate of the New York Yankees come into town with 8 lefties on their line-up cards. All those southpaw hitters would beat up on our pitchers. In higher levels of baseball it is a necessity to have a balanced line-up to compete over the long haul. If your players reach these higher levels like high school baseball, college baseball or even professional baseball they will be in a competitive category of only 10% of the population. Take a pro scout. He knows that right-handed pitchers and hitters basically grow on trees. A dime –a dozen. Nine out ten players. But wait. You want to watch scouts scurry around for their radar guns and stop watches when a lefty player comes to home plate or the pitchers mound. Every one of the college and professional scouts are looking for southpaw players. Why? Because to have a good balanced competitive championship ball club you need them. Often you will see youth players flip over from the right side and try to switch hit. They take a few swings in the batting cage and hit a couple balls pretty good. Their coaches and instructors give them self confidence to try it. They do it a few times. Then, in the bottom of the 7th with the game on the line they go back to righty swinging. This will never work. As a coaching tip you cannot allow players to flip-flop at yours or their convenience. You have to stick with it or don’t even go there. It is all or nothing. You are wasting at-bats if you flip-flop. You either go full time lefty, authentic pure switch hitter, or just stay righty. There is no in between. No changing from at-bat to at-bat. Bottom line: Lefty is the first choice. Switch-hitter is second choice. Righty batting is 3rd choice. Pick one plan and stick with it. It is pretty easy to start a toddler or t-ball age player to bat exclusively lefty. It is a little harder to start them to throw lefty at an early age but not impossible. Throwing is not as big a deal as batting. Although throwing righty and batting lefty is probably a very valuable winning combination for baseball hitting. You can play all nine positions and bring the much needed rare southpaw bat to the ball club. If you throw lefty you will only be kept in the outfield, first base and pitchers mound. An elite baseball team coach asked me to talk to his team recently about how to get noticed and recruited to college. They wanted to know what they have to do to get recruited? The first words out of my mouth were kiddingly “Bat left or throw left.” I was trying to make light of it. But the more I thought of it the more I knew it to be true. I had fifteen eager teenage competitive players in front of me and if three or four were southpaws they would the leading candidates to go on and play. At least they would get a longer look and get the radar guns and stop watches out. My Dad started baseball hitting with my little brother and me batting from the left side from the first time we could hold a wood bat. It sure helped prolong my career and I’m ever so thankful he had the foresight to do that. Thanks Dad! for the great early start to baseball hitting left-handed.